Jonathan Davenport has worked on just about every kind of creative endeavor in entertainment, but his most high-profile, and strangest, project yet, might be designing costumes for WWE wrestlers. A design for pancake-themed gear for New Day by Jonathan Davenport. CHRIS URSO | Times Jonathan Davenport poses for a photograph Thursday, Nov. 29, 2018 at his home in Palm Harbor. Davenport is a freelance “narrative designer” who has done a bit of everything. He has written B movies, designed a cheerleading video game, scripted an Einstein robot and, currently designs costumes for WWE wrestling team The New Day. CHRIS URSO | Times A photo of The New Day WWE wrestlers in costumes created by Jonathan Davenport are seen right along with a other Davenport designs Thursday, Nov. 29, 2018 at Davenport’s home in Palm Harbor. Davenport is a freelance “narrative designer” who has done a bit of everything. He has written B movies, designed a cheerleading video game, scripted an Einstein robot and, currently designs costumes for WWE wrestling team The New Day. PALM HARBOR — When the WWE wrestling tag team New Day requests costumes that channel Sonic the Hedgehog, flatulent unicorns or a buffet of pancakes, they have a go-to guy. Jonathan Davenport doesn’t ask questions when those emails come in. The wrestlers recently asked Davenport for outfits that look like “Christmas threw up all over them.” Again, Davenport didn’t ask questions. Those new uniforms will debut Tuesday on WWE Smackdown. 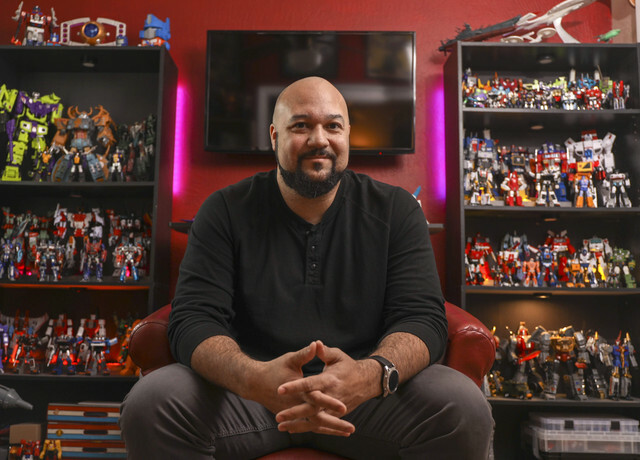 Davenport works from a home office in Palm Harbor, surrounded by vintage Transformers, his childhood Sega gaming consoles and toys he helped create. He calls himself a “narrative designer,” a term he borrowed to help explain his job. For a long time, when someone asked what he did for a living, he avoided the question. It’s not easy to explain. The art he makes tells a story. Davenport’s work, all creative, is also all over the place. He wrote a couple Fairly Oddparents computer games and did story development for All Star Cheer Squad, a cheerleading video game for Nintendo Wii. He helped create interactive Avengers Playmation toys for Disney and worked on the team that imagined what the Disney’s Toy Story Land would be. He drew storyboards for the Tupac Shakur biopic All Eyez on Me. Even his failures check a certain kind of dream box. On the wall across from his workspace is a poster for The Gig, an unmade movie about a guy in a band who fights vampires by night. He’s a man of many deadlines. He had to push this interview back to make storyboards for a “fantastical” TV series by one of the creators of Moonlight. It’s being developed for Oprah’s OWN network, he said. And, he had the Christmas wrestling costumes due at the same time. When he was 10 and growing up in St. Petersburg, Davenport started drawing a comic book series for a readership of one: his mother. He kept it going for dozens of issues until the story arced to an ending. Davenport went to the University of Central Florida’s film school. He later taught game and graphic design part time during the day in Tampa, and worked nights at Nielsen Media Research, where his job was to watch TV and write trivia questions to see if audiences were noticing product placement. With little sleep and a young daughter at home, he started checking the “gigs” section of Craigslist for a creative outlet. He saw an ad from a guy looking for character designs for a wrestling cartoon in the style of the Teenage Mutant Ninja Turtles. The job paid almost nothing and the show went nowhere. But the connection was invaluable. Austin Watson, who wrestles as Xavier Woods, was behind the cartoon. Watson was trying to make it with NXT, the WWE’s Florida-based developmental league. He asked Davenport if he’d consider taking a stab at designing some tights and wrestling gear for him. He drew something up for him, and forgot about it until a co-worker at Nielsen who’d been assigned the WWE show Smackdown pointed out that Watson had made it to the show. He was wearing the gear Davenport designed for him on national TV. When Watson teamed with wrestlers Koffi and Big E. to become the tag team New Day, he asked Davenport to design their gear. At the time their gimmick was a “sort of a Southern, preacher vibe, but without the religion.” Davenport came up with a costume he called “the baptizer,” which included a collar and shiny stole. But the preachy gimmick wasn’t sticking with fans. Watson, a geeky pop culture fanatic, gamer and admitted fan of My Little Pony, began leaning into those aspects of his persona. He sent Davenport design concepts that were more out there, wild colors that invoked old cartoons and video games and the team’s inexplicable love for owls. Davenport spoke the same nerd language, from Dragon Ball Z to Tron to Batman. “He got my references, which made the whole process much easier,” Watson said. When the team was trying to figure out the right look for Big E, who is massive, his mind went to Batman villain Bane, who wore a duster in the Dark Knight Rises. It’s now a signature look. 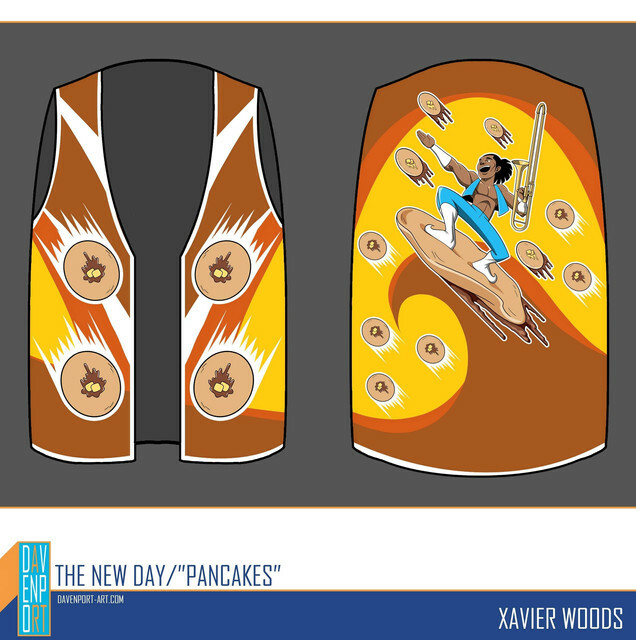 A pancake design by Jonathan Davenport for Xavier Woods. He made this after the New Day requested pancake gear. The New Day took to wearing unicorn horns and throwing pancakes at the audience, thriving with their new, weirder persona. They’re now a fan favorite, and set a record for longest-running Smackdown tag team champs. For Davenport, who has been able to return to creative endeavors full time, the coolest part has been collecting the action figures of Xavier Woods, Big E and Kofi Kingston wearing his designs. Those figures hang on the office wall, too.